I’ve just been staring transfixed at the fallout from the election of Jair Bolsonaro in Brazil, and the words which normally come bubbling up on their own just haven’t been there for me. 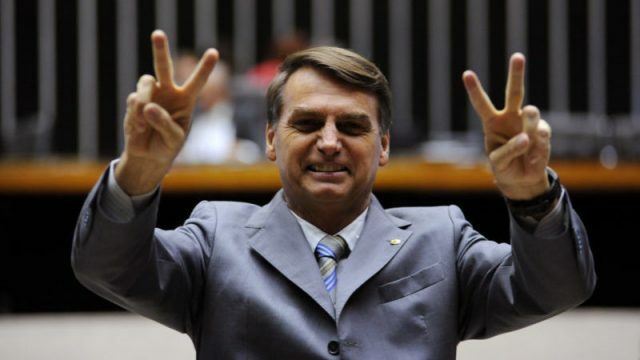 Bolsonaro is a fascist. I mean that in a very real, literal and non-alarmist way. I’ve seen a lot of conservatives in both the US and Australia defending him as just another right-wing nationalist like Donald Trump, which is partly due to the fact that he has been straightforwardly labelled the “Trump of the tropics” and the “Brazilian Donald Trump” by the English-speaking mass media, and partly due to the fact that the political left has been warning of the danger Bolsonaro poses using the exact same language they used to warn about Trump. So in a way, it’s understandable that the two men would be lumped into the same group in public perception. The right (the MAGA hat-wearing “Build the wall” right, not the tiki torch-waving “Pinochet did nothing wrong” right) would probably mostly object to Trump calling for a civil war in America in which tens of thousands of Americans would be rounded up and murdered, advocating the physical assault of homosexuals in the street, openly proclaiming that he wants America to be a dictatorship etc, but these are all things Bolsonaro has publicly spoken in favour of. But because they’ve been hearing him described using the exact same labels and dire warnings that were hyperbolically applied to Donald Trump, who minus the rhetoric and hysteria has turned out to be a fairly conventional Republican president, conservatives assume Bolsonaro is fine. All the most severe linguistic tools were used up against Trump, so there were none left in the toolbox for Bolsonaro. If you think it’s unreasonable to be worried about Bolsonaro, watch the clip below in which Glenn Greenwald, who lives with his husband and adopted family in Brazil, breaks down the situation in eight minutes. Most of my readers are probably fans of Greenwald regardless of where they’re at on the political spectrum, and you only need to feel into the urgency of his tone in the video to get a feel for how dangerous things have become in that country for a gay, leftist domestic dissident journalist – all of which are features Bolsonaro views with a seething hatred. So that’s happening. The world’s fifth most populous nation is about to come under the control of a violent fascist who wants to bulldoze the Amazon rainforest, an important carbon sink that has played an enormous role in slowing climate change. And, speaking for myself in the here and now, the world honestly does appear a bit darker as a result. Standing in opposition to humanity’s ecocidal and omnicidal trajectory is, at its core, an act of faith. There is no logical reason that can be laid out with facts and evidence to believe our species can stop doing what it has been doing and change by sufficient orders of magnitude in time to avert our own destruction. It is rare enough for individuals to suddenly and drastically change their own deeply ingrained thought and behaviour patterns; no matter how scientific and rational you think you are, to believe that we can all do such a thing at once is to believe in miracles. Maybe your miracle looks like everyone suddenly getting fed up with the status quo and using their strength in numbers to create a political system that benefits everyone, in which mankind begins collaborating with itself and its ecosystem in a radically unprecedented way, but you still believe in miracles. Or maybe you don’t, I don’t know. Maybe whether this endeavour is winnable or not is entirely irrelevant to you, and you’re standing and fighting on general principles. Maybe in the war against delusion you’re one of those “Keep firing and take as many of the bastards with me as I can” soldiers who fights on to the last man not because he thinks he can win, but because the fight is intrinsically worth fighting until your last breath. Either way, the only way victory is coming is if something never before seen bubbles up from the unknown. But guess what? Almost all of life is made up of the unseen and the unknown. Our auditory and visual fields only take in a very narrow spectrum of sound and light. Our brains process 400 billion bits of information per second, yet we are only aware of about 2,000 of those. The world our senses take in and form thoughts about bears no resemblance whatsoever to the world as it is actually occurring on the level of particles far too small to be seen with the naked eye, and science is still mostly clueless about exactly what the smallest of those particles even are. The mysteries of the brain are only just barely becoming known to science. The nature of consciousness itself, the means by which any of us experience anything at all, remains a complete scientific mystery. What we know we don’t know dwarfs what we know, and what we don’t know we don’t know dwarfs what we know we don’t know. Me? I believe in miracles. I have seen far too many in this life not to. I believe that the unprecedented has far, far more wiggle room than it needs, within that yawning information gap of what we know, to allow for the possibility of something unexpected bubbling up from a direction nobody was even looking in. There are plenty of gaps between the floorboards for the old patterns to fall through. On the frontlines of the real revolution, the only revolution that has an actual shot at victory, stand the healers. Not the activists, not the journalists, not the teachers, not the preachers, not the artists, but the healers. The pattern disruptors. Those who are able to clear old, habitual conditioning patterns in themselves and in the collective and make way for life in its natural state. Healers are typically unseen and unrecognised, because our society only values the ability to make new things, not the ability to disappear them. But they are there, they are everywhere, working their ancient miracles in secret wherever there are people. The most revolutionary thing anyone can do is relinquish their particular conditioned mental habits, because humanity’s conditioned patterns are what brought us to this point. This undoing, this healing, has nothing to do with having the right ideas in your head or espousing the correct ideology; it’s entirely a game of subtraction. Of finding those old, dense, fearful parts of our conditioning patterns which we developed over a lifetime of pain and trauma, making them fully conscious, and releasing them. Not to replace them with anything new, but to leave that freed-up energy available for responding to life as it is actually presenting itself. The healers know that this is possible, and anyone can become a healer. All it takes is the sincere desire to become a truthful human being on the deepest levels possible, and a genuine curiosity about the ways in which that is not currently happening. This capacity exists within us all. It is unrecognised, unappreciated and unvalued by society, but it’s there; a doorway through which the unknown and unprecedented can be allowed to pour into our world. But there are things in the realm of the known which give me hope as well. Trust in the plutocrat-controlled mass media is at an all-time low while our ability to network and share information is at an all-time high, which means that a populist takeover of civilisation’s dominant narratives is more possible than ever. Whoever is able to control the stories that the public is telling about themselves, their society and their world, controls the public; if the public starts coming up with their own stories and elevating the ones that are most truthful and beneficial to them, the dominator class will necessarily lose control of the masses which vastly outnumber them. Indeed, propaganda narratives are the only thing holding the oppression machine in place. Stories. Fairy tales. The only thing keeping people from rising up and overthrowing the dominator class is the fact that too many of us believe the stories they’ve been telling us using their ubiquitous narrative control. Our chains are made of fairy tales. Made of language. You cannot tell me that’s not winnable. Our species is getting progressively better at educating itself, taking care of itself, and becoming less violent. Spiritual teachers who’ve been coaching people on how to change their relationships with their minds say that they’ve recently noticed an overall increase in people’s ability to awaken from deeply conditioned ways of functioning. Are these changes happening quickly enough to avert catastrophe? On paper, probably not. In practice, who knows? There are far too many unknowns and hidden wild cards in the deck. It is those wild cards that keep me going. By fighting untruth both in myself and in the world, I take the fight where it needs to be. By doing my best to stay as fully present and engaged with life as it is, I remain on the alert for opportunities when gaps open up which can be seized upon to shine the light of truth through. By maintaining my faith in the existence of unknown variables, I never give up, never let the fight go out of me, no matter how dark it gets. As far as we know, it is still very, very possible for us to win this thing.